A few weeks ago I talked about all the things I need to change in my kitchen, and Ten Coffee Day commented about extending the wood flooring into the kitchen. Well, I went looking for the flooring we used in the rest of the house, but I couldn't find it! I bought it at Costco 3 years ago and I guess they no longer have it, and I didn't have enough left over to finish off the kitchen. The upside to this is that since flooring is a laminate, it doesn't handle water that well, so I wasn't entirely sure I wanted to extend the laminate into the kitchen anyway. 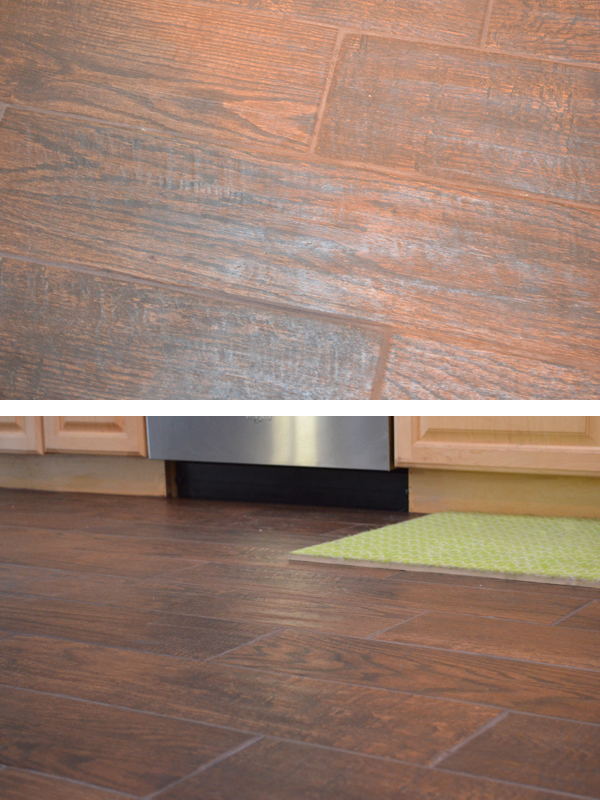 But, I loved the idea of having a cohesive look throughout the living room, dining room, and kitchen, so I decided to go with tile flooring that looks like wood! I'd heard of wood look tile before, but I wasn't convinced it looked realistic. Well....it looks REALLY good. I think it looks more realistic than the laminate flooring we have now. We decided on Montagna Saddle, because it most closely matched our current floors. The kitchen is almost done, but I'm not ready to show the entire thing yet because we are still missing a a fridge and pendant lights, but we're almost there! Glad it worked out, I think the kitchen will look so much larger without the flooring being so different from the surrounding areas. It looks so much better, thank you for the suggestion! No problem. I've always found it interesting that I can look at my own design issues and find myself stuck, while someone else looks at it for ten seconds and suggests the solution.